With Spring in full bloom, the Galilee is a place of beauty with wild flowers cascading through the lush green hills, the smell of the citrus in the air and the white blossoms have fallen to the ground, to make way for the first fruits. 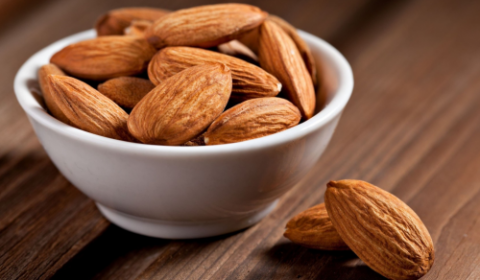 May heralds the beginning of the elusive fresh, green almond, a misunderstood nut that is grown in Northern Israel and throughout the Middle East. 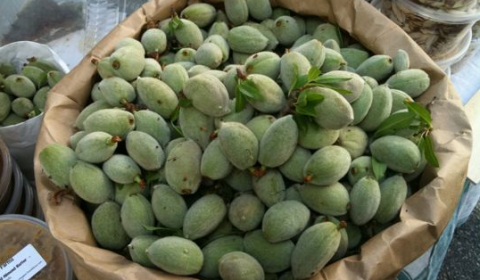 South of Nazareth in the Lower Galilee is the Arab village of Iksal, famous for their almond groves and the abundant harvests of a special strain of almond called Um al-Fahem. unique not only in it’s size and taste but also for it’s extra soft skin. These almonds are sold as fair trade and known to be amogst the best in Israel. Delicate in both flavour and texture, the young, unripe nuts are picked whilst the outer skin remains light green and furry, well before the hard brown shell of the almond has had the chance to form. Inside the light olive green casing is a smooth, soft, white almond with a subtle, grassy flavour. They can be eaten both whole as a sour fruit, due to the tart flesh, shelled and dipped into lemon juice or olive oil for extra flavour or simply plain and scattered into salads, raw and whole, lightly toasted or even sliced thinly, furry skin and all, adding a new dimension and texture to any already fresh, vibrant salad. These understated translucent spring gems have a short season, before the almond hardens and the green shell turns a brown and is sold in the Israeli markets in the sacksful. 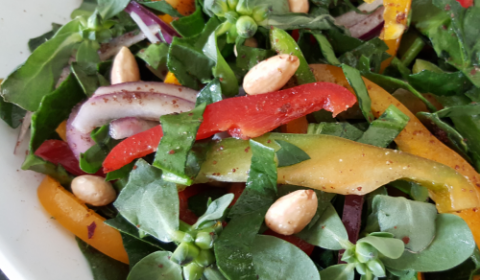 add the green almonds & sprinkle the remaining sumac over the top & serve….. Previous Postit’s a wonderful, culinary world out there…..
Next Post‘foodography’ the genre of food art…..